For as long as we've had agency ebook pricing, we've always talked about the same six publishers having control over their ebook prices: Hachette, Macmillan, S&S, HarperCollins, Penguin, and Random House. Even after the PRH merger, it was still the same six names: Hachette, Macmillan, S&S, HarperCollins, and Penguin Random House. But now we may need to add another name to the list. 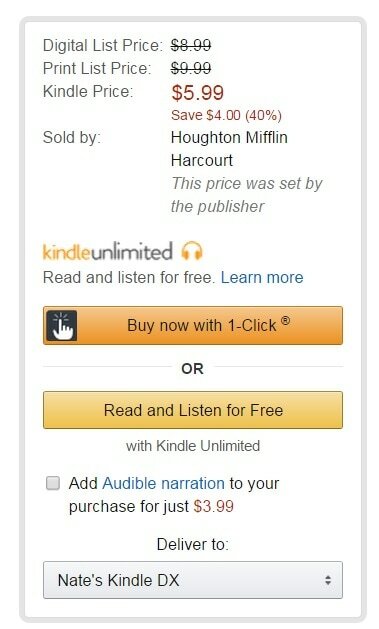 A reader has tipped me to the news that Houghton Mifflin Harcourt, one of the larger US trade publishers not counted among the Big Five, may have a new contract with Amazon. If you go browse the Kindle Store you will quickly notice that all the listings for HMH titles now say "This price was set by the publisher" (I checked a score of titles). In the past that has been a sign that the publisher had secured control of the prices of its ebooks by negotiating a new contract with Amazon. You can find the declaration on ebooks from Hachette, Macmillan, HarperCollins, S&S, but not Penguin Random House (the new contract has not gone into effect). And now that declaration is showing up on ebooks from HMH. So does this mean that HMH has an agency contract? Edit: It's two days later and I think the deal has happened. Before publishing this post, I spot checked ebook prices in the Kindle, Nook, and Kobo Stores. Amazon was consistently cheaper, often by a huge margin. For example, The Handmaid's Tale was $3 in the Kindle Store and a lot more in the Nook and Kobo Stores ($10, $12). While it is possible that HMH could have signed an agency deal with price disparities, I don't think it is very likely. Instead, I think that the Kindle Store has a glitch. And so I wanted to warn you of the glitch before someone else finds it, jumps to the obvious conclusion, and reports the story without confirmation. But that new contract might be about to go down, so let's keep an eye out. If the price of HMH ebooks are suddenly the same in all the bookstores, then we'll know that it happened.